For the comic, see Incorruptible. Incorrupt body of Mary of Jesus de León y Delgado, Monastery of St. Catherine of Siena (Tenerife, Spain). Incorruptibility is a Roman Catholic and Eastern Orthodox belief that divine intervention allows some human bodies (specifically saints and beati) to avoid the normal process of decomposition after death as a sign of their holiness. Bodies that undergo little or no decomposition, or delayed decomposition, are sometimes referred to as incorrupt or incorruptible. Incorruptibility is thought to occur even in the presence of factors which normally hasten decomposition, as in the cases of saints Catherine of Genoa, Julie Billiart and Francis Xavier. In Roman Catholicism, if a body is judged as incorruptible after death, this is generally seen as a sign that the individual is a saint. Canon law allows inspection of the body so that relics can be taken and sent to Rome. The relics must be sealed with wax and the body must be replaced after inspection. These ritual inspections are performed very rarely and can only be performed by a bishop respecting canon law. A pontifical commission can authorize inspection of the relics and demand a written report. After solemn inspection of the relics, it can be decided that the body is presented in an open relicary and displayed for veneration. Catholic law allows saints to be buried under the altar, so Mass can be celebrated above the corpse. The relics of Saint Bernadette were inspected multiple times, and reports by the church tribunal confirmed that the body was preserved. The opening of the reliquary was attended by multiple canons, the mayor and the bishop in 1919, and repeated in 1925. Not every saint, however, is expected to have an incorruptible corpse. Although incorruptibility is recognized as supernatural, it is no longer counted as a miracle in the recognition of a saint. Embalmed bodies were not recognized as incorruptibles. For example, although the body of Pope John XXIII remained in a remarkably intact state after its exhumation, Church officials remarked that the body had been embalmed and additionally there was a lack of oxygen in his sealed triple coffin..
Incorruptibility is seen as distinct from the good preservation of a body, or from mummification. Incorruptible bodies are often said to have the odour of sanctity, exuding a sweet or floral, pleasant aroma. Saint Alexander of Svir – the incorrupt relics of the saint were removed from the Svir Monastery by the Bolsheviks on December 20, 1918, after several unsuccessful attempts to confiscate them. Finally, the holy relics were sent to Petrograd's Military Medical Academy. There they remained for nearly eighty years. 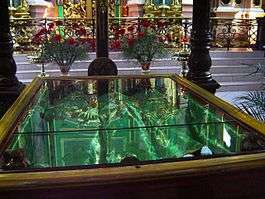 A second uncovering of St Alexander's relics took place in December 1997, before their return to the Svir Monastery. Saint Ioasaph of Belgorod – In 1918 the Bolsheviks removed Saint Ioasaph's relics from his shrine in the cathedral of the Holy Trinity at Belgorod, and for some seventy years, their whereabouts remained unknown. In 1927, the cathedral itself was demolished. In the late 1980s, the relics were discovered in Leningrad's Museum of Religion and Atheism, and on 16 September 1991, they were solemnly returned to the new Cathedral of the Transfiguration of Our Lord in Belgorod, in the presence of Patriarch Alexy II. During marble excavations on the Appian Way in Spring 1485, workers found three marble coffins. In one, twelve feet underground, was the corpse of a young woman, said to have looked as if it had been buried that day, despite being about 1500 years old. The corpse attracted 20,000 plus crowds of spectators in the first few days, many of whom believed it to be of Tullia Ciceronis, whose epitaph was on one of the tombs. The body of Blessed Mary of the Divine Heart Droste zu Vischering found to be incorrupt by the Catholic Church. 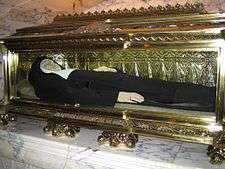 The body of Saint Bernadette of Lourdes with wax face and hand coverings, found to be incorrupt by the Catholic Church. (b. January 7, 1844 – d. April 16, 1879). The new recumbent statue (1987) of Saint Clare of Assisi, with the reliquary below. (b. July 16, 1194 – d. August 11, 1253). The body of Saint John Mary Vianney wearing a wax mask, found to be incorrupt by the Catholic Church. (b. 8 May 1786 – d. 4 August 1859). The body of Saint Padre Pio of Pietrelcina wearing a silicone mask, found to be incorrupt by the Catholic Church. (b. 25 May 1887 – d. 23 September 1968). The body of Saint Alphonse Mary of Liguori, found to be incorrupt by the Catholic Church. (b. 27 September 1696 – d. 1 August 1787). 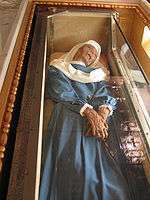 The body of Saint Joaquina de Vedruna, found to be incorrupt by the Catholic Church. (b. April 16, 1783 – d. August 28, 1854). The body of Saint Zita, found to be incorrupt by the Catholic Church. (born c. 1218 - d. 27 April 1272). 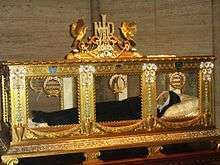 The body of Saint Catherine Labouré, found to be incorrupt by the Catholic Church. (b. May 2, 1806 – d. December 31, 1876). The body of Venerable Mary of Jesus of Ágreda, found to be incorrupt by the Catholic Church. (b. April 2, 1602 – d. May 24, 1665). 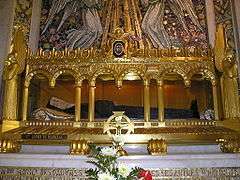 The body of Saint Rita of Cascia, found to be incorrupt by the Catholic Church. (b. 1381 - d. May 22, 1457). The body of Saint Luigi Orione, found to be incorrupt by the Catholic Church. (b. June 23, 1872 – d. March 12, 1940). The body of Saint Virginia Centurione, found to be incorrupt by the Catholic Church. (b. April 2, 1587 – d. December 15, 1651). ↑ Quigley, Christine (2005). The Corpse: A History. McFarland. p. 254. ISBN 0786424494. ↑ Sandri, Luigi (1 June 2001). "Blessed John XXIII's Remains Are Now On View At St Peter's". Christianity Today. Archived from the original on 11 February 2014. Retrieved 11 February 2014. ↑ The Marvelous Wonderworker of All Russia, Holy Venerable Alexander of Svir. St. Petersburg: Holy Trinity Monastery of St. Alexander of Svir, 2002. ↑ Carroll Cruz, Joan (1977). The Incorruptibles: A Study of the Incorruption of the Bodies of Various Catholic Saints and Beati. Charlotte, NC: TAN Books. ISBN 0-89555-066-0. ↑ "Arouca, ainda mal conhecida". Aveiro e o seu Distrito. December 1967. The Incorruptibles: A Study of the Incorruption of the Bodies of Various Catholic Saints and Beati, by Joan Carroll Cruz, OCDS, TAN Books, June 1977. ISBN 0-89555-066-0. Christian Mummification: An Interpretive History of the Preservation of Saints, Martyrs and Others, by Ken Jeremiah, OCDS, McFarland & Co., Inc., 2012. ISBN 0786465190. Wikimedia Commons has media related to Incorruptible bodies. "Incorrupt Bodies Of the Saints". Archived from the original on 2008-06-14.